perhaps you are wondering how we can reclaim integrity in ministry? Charisma is holding a telecall with J. Lee Grady and Larry Stockstill on Tuesday, September 2nd, 2008 at 8 pm (EDT)...and you are invited to participate! to register for this call, please click here. I have attended several calls that were previously hosted by Charisma; and I have not been disappointed. You can listen to previous interviews here. Find out more about Charisma here! continue reading "Integrity in Ministry"
Are You Cheating on the Lord? There is a strong dichotomy that cannot be denied when one analyzes the allegiance the child of God must have. The child of God must love the Lord and hate evil. The Word tells us that to be a friend of the world is to be an enemy of God's. Even James uses strong words in his letter to early Christians by calling them adulterers because of their relationship with the world while they claim to be in relationship with the Lord! It is important that we recognize that we cannot have fellowship with the Lord and fellowship with the world at the same time. When will we stop cheating? Often we seek God for His delivering power, for His anointing, for many things - constantly desiring a way out of our circumstances, an answer to our dilemmas, a "way out of no way." Unfortunately there are times when we make those requests while we are still holding on to some "things and or some people." But the psalmist encourages us that God will guard our lives, He will deliver and He will provide light and joy. However, there is something we must ensure we are not guilty of: cheating! If we love the Lord then we will hate evil - we will not cling to those things or people that are contrary to His Word, will and way! He requires that we be faithful in our relationship with Him! He will shine line in those dark areas of our lives - He will give us joy when we are downcast. Rejoice and praise Him - give Him the honor due His name - and while you are at it - make sure there isn't anything in your life that characterizes you as a cheater - for He is a jealous God and He requires your faithfulness and your praise! continue reading "Are You Cheating on the Lord?" Have you ever wondered what really works to get FREE publicity? AND she will provide you with strategies that will lead you to a solid plan! television, radio and print coverage. You don't want to miss this amazing event! as well as other special attendee ONLY bonuses and discounts. a specialist in small business publicity. As a publicist, my job is to help my clients get media coverage. The tool I use most often on their behalf is the simple, but highly effective, press release. What I do isn’t rocket science; seeking publicity can be an in-house job for most small business owners. Press releases can seem like a panacea for small business owners. The prospect of getting free publicity in exchange for a couple of hours of writing and submitting a 400 word release seems like a great deal. And on the surface – it is a great deal. The publicity generated from one release picked up by a major media outlet can increase awareness and sales with a far greater impact than buying advertising in the same outlet. Under the surface though, lurk thousand of disappointed publicity seekers who for one reason or another did not get the coverage they desired. I used to believe that the reasons for the failed attempts lay mostly, if not entirely, on the message within the release. While those are definitely factors that will get your press release a one-way ticket to the circular file, most serious business owners I’ve met don’t fall victim to these mistakes. They took the time to craft newsworthy releases that were topical, relevant and well-written. They had the initiative to create a targeted media list to submit to – and yet still they struggled to get coverage. It was only when I dug deeper and examined other aspects of their failed efforts that a few trends began to emerge. There are factors in press release pick up that the professional publicist innately utilizes for the benefit of their clients that most small business owners just aren’t aware of. The timing of your submission is one component that is often to blame for poor results. You see, each media outlet has what is called a lead time. This is how far in advance they need to start working on stories that will eventually appear. Magazines with a large circulation tend to have the longest lead times, often 9 months or longer. If you send out a release geared towards Christmas to a major magazine in November, you’ve missed your window of opportunity by eight months! You don’t necessarily need a publicist to get over these hurdles, you just need to be aware of what hurdles exist. Overcoming them is usually a fairly simple matter. As I said before, getting media coverage is not rocket science. You can improve your odds significantly with a little fine tuning. ---For more tips on turning the odds in your favor, you’ll want to grab the free special report. continue reading "Fine Tuning Your Press Release - FREE Report"
Do you know your (specific) hymn(s)? continue reading "Smiling Through Familiar Hymns"
You Do Make the Difference! with donations of money, kindness, and hard work. that our purpose on earth is to serve God. You can read more of the background here. but rather than focus on this 'one day' as a time to "be an angel"
to each and every person that we come into contact with? Simple things make a difference. Little things done well make a difference. You do make the difference. Know it. Act on it. to touch each person's life and to make a real difference, each & every day! What are your thoughts? I welcome your comments! continue reading "You Do Make the Difference!" The baby won’t sleep. The kids won’t listen. The house is a mess. Your husband wants to know what is for dinner. And the clock just won’t stop. You can’t take this pace much longer. But what can you do? Motherhood is hard – brutally hard. And sometimes it all is just too much. But what options does a busy mom have? The “show” must go on. The bills need to be paid, the children need to be looked after… and there is no one standing there ready to grab you when you fall. Yesterday, a national talk show contacted 5 Minutes for Mom to help them in their search to find overwhelmed moms. They want us (5 Minutes for Mom) to help them find women to share their stories – women who are wonderful mothers, but have so much on their plates that those plates just might break. They are looking for brutally honest confessions from stressed and overwhelmed moms. Feel like sharing your story? continue reading "Searching for Overwhelmed Moms"
Do you continues to push yourself, even though your body is begging you to slow down? I encourage you to read this article entitled 'An Act of Faith'; it will speak to your weary soul. Listen to God's whisper; what is He saying to you? continue reading "An Act of Faith"
WOW's mission is to Inspire, Encourage, and Empower Christian women (and men!) toward a closer walk with Jesus Christ! Register and download a FREE copy of WOW! Magazine today! Join WOW's email listing and be sure to get updates about this awesome publication each month! You are invited to attend The Hem's Grand Opening! FREE School of the Spirit Celebration! Ameerah Lewis has put her whole heart into planning and designing this celebration for everyone who has a heart for God and a passion for getting to know Him in a more deep and intimate way! The class is called 'Reaching for the Hem' and the whole focus is to teach Christians how to truly reach out and connect on a more intimate level with their Heavenly Father. You can attend the free classes by phone or via the web, whichever you prefer. The classes will take place every two weeks until September 11th, 2008, but registration is still open. continue reading "Please come as my guest..."
Parables is a new Christian magazine that was launched in July '08 and is able to be viewed for free all around the globe. The magazine is filled with stories and lessons of growing in Christ; the articles are all written by non-published, published, new and established authors from all over the world. 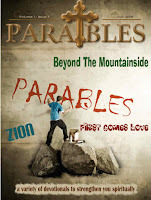 The 2nd issue of Parables will be released on September 25th, 2008. * Pecan Tree Publishing invites authors to submit their work. continue reading "Parables * New Christian Magazine"
Will you GO DEEPER with God? until that fantastic day when Jesus returns. My pastor recently talked about going deeper with God. It made me think about what kind of Christian I am and what I should be. Continue reading to find out what type of Christian you are. continue reading "Into the DEEP!" Every church should have this sign on their front lawn. continue reading "Jesus is Coming!"